Use a small sharp knife to split the vanilla bean lengthways without cutting all the way through. Place the sugar, water, lemon juice and vanilla bean in a medium saucepan over low heat. Cook, stirring, for 2-3 minutes or until sugar dissolves. Increase heat to high and bring to the boil. Reduce heat to medium and simmer, uncovered, for 5 minutes. Remove from heat and use tongs to remove the vanilla bean. Use the knife to scrape the vanilla seeds into the sugar syrup. Discard the pod. Add the watermelon pieces to the syrup and set aside for 25 minutes to develop the flavours. Dry fry the coconut in a small non-stick frying pan over low heat for 3-4 minutes or until golden brown. Transfer to a small bowl and set aside for 5 minutes to cool. Make up the pancake mix following the packet instructions and add the cooled golden coconut to the mix just prior to cooking. Brush a medium shallow non-stick or cast-iron frying pan or crepe pan with extra melted butter to lightly grease. Heat over medium heat until it foams. Pour 60ml (1/4 cup) of batter into pan to make a 12cm pancake. Cook for 2-3 minutes or until bubbles rise to surface and pancake is golden underneath. Turn with a spatula or toss. Cook for a further 1-2 minutes or until just cooked. Transfer to a plate and cover with foil to keep warm. Repeat with remaining batter to make 12 pancakes, greasing the pan if the pancake begins to stick, and stacking the pancakes as they are cooked. 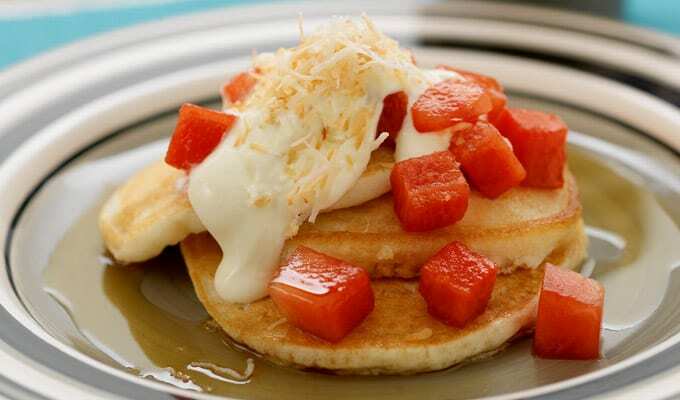 Divide pancakes among serving plates, top with the watermelon and drizzle with the vanilla syrup. Top with a dollop of the double cream and serve immediately.